Don’t you love that every month the Hip Kit Club scrapbooking kits are perfectly balanced for either BOY or GIRL themed projects? My starting point for this page was firstly the FEBRUARY mood board, as well as Ashley’s FREE cut files. I chose a narrow color palette of cobalt, yellow, teal & aqua for a trendy feel; the results are fabulous….& obviously very BOY!! My son Max is smart, sassy & always question life & the universe! He never takes things at face value & always analyses everything he is faced with. Sometimes it really drives me crazy, but I do know that God gave him his super charged brain for a unique purpose, so we strive to help him embrace being different, & be OK with who he is. This memory was worth scrapping & I wanted the page to make a STATEMENT in his album. What better way to make a statement, than with the super, fun, bold, stripe from Amy Tan as seen in the February kits? It made the best base for my page! Don’t you just love the watercolor vibe she has going on in this collection?? 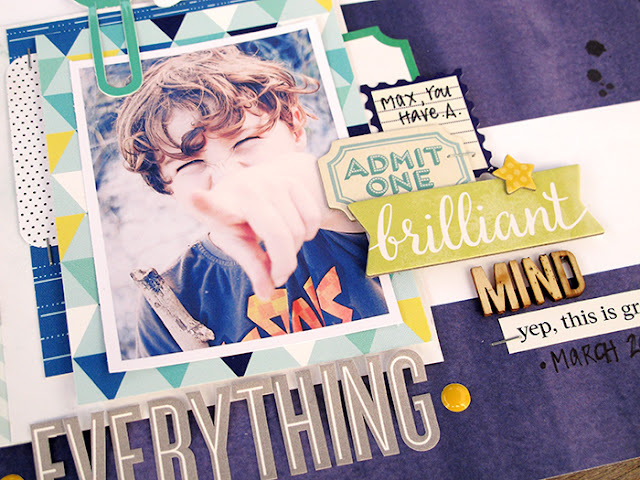 Next came my title, I wanted it to be a funky mixture of the cool fonts & die cuts included in the February kits. When working with Ashley’s FREE cut files, I decided to try something different. I opened the background cut file & isolated one of the talk bubbles, then super sized it. 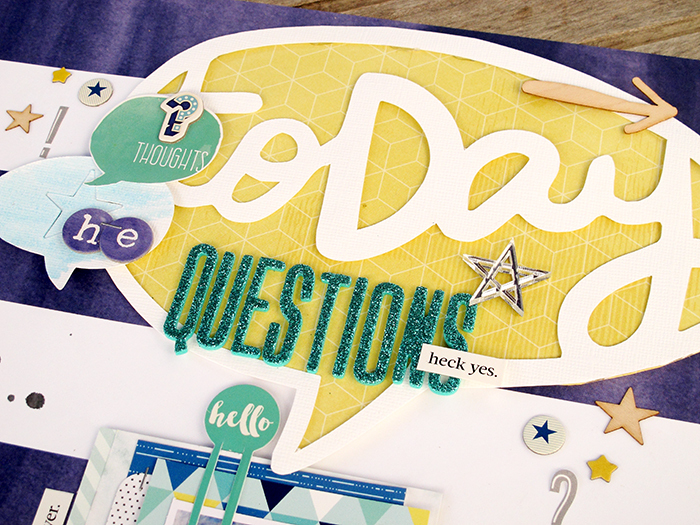 It became an intricate part of the page design by conjuring up thoughts of BIG CONVERSATION, as well as making up part of the title, together with the Amy Tan chipboard alphas, & glittery foam alphas from American Crafts, in such a fun way! Next I worked on the photograph. HA! this shot really embraces his sassy attitude towards life. I love it!! Underneath you’ll notice I layered journal cards, paper pieces & tags…it not only makes for an eye catching cluster but gives the photo extra height too. For the secondary title on the right of the photo, I used a few of the cute printed chipboard bits from the Shimelle pack found in the Embellishment kit, & stickers from Amy Tan as found in the Project Life kit. Little wood alphas (from last month’s kit), enamel dots, grey alpha stickers & staples finish off things nicely here. Thanks so much for joining me today! I hope this project has inspired you in some way! Remember to join the happy gang on our FB members forum, where we all hang out, chat & share our creativity!